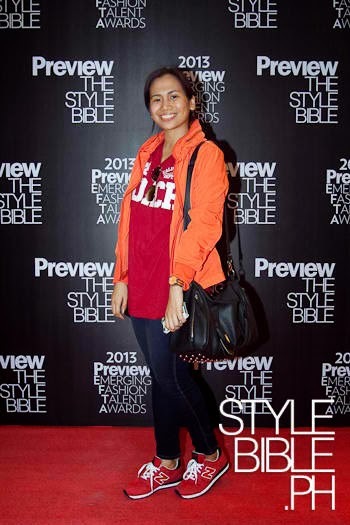 Congrats to the ten budding design talents named awardees of the Preview Emerging Fashion Talent Awards 2013 (PEFTA) - whose six piece collections were on display last September 18 till the 24th at the SM Aura Premiere. PEFTA is Preview Magazine's way of providing a platform for emerging talents. 1) With the aerodynamics of sports cars as inspiration, Pristine de Guzman brings air movement into her collection through geometric design elements of the garments. 2) Geoffrey Zordilla played with various tints and shades to portray the flow of sea waves in his dresses. 3) A life in transit is what Bea Samson exhibits as she captured images of city lights and moving vehicles and used these as a print for her handiwork. 4) Kevin del Poso merges the static and the movement of photography in the dresses he created. 5) Tony Evan made an oriental-themed collection with textures and shapes reminiscent of dragons, lanterns and salmon roe. 1) Alexandra Cheng combines stillness and movement with a hint of androgyny in her collection. 2) Artful designs, with curve lines and attractive prints mark the fashion trademark of Marian Zara Madayag. 3) Bien Santiago of Yuminum Bikinis introduced the movement of wind into her swimwear.